Been so long since I did a fitness, post, way too long. I thought I would post about something I’m working on myself. I did the practice, and worked out something that I find works for me at least, so I’m hoping it might work for someone else out there. It’s an area a lot of people struggle with, and I’m no different. 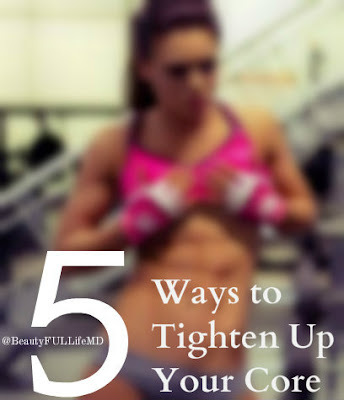 I’m not a fitness coach, or a personal trainer or anything close, but from my research and workouts I’ve found that these little tips help with tightening up your core. And once you’ve done that, your workouts become a little easier. If you have strength here, you are that much closer to strength everywhere else. 1. Have good posture. This makes a world of difference. It’s a passive type of workout. Keeping those muscles engaged contributes to increasing their tone. One step closer to looking hot on the beach! 2. Take the stairs. It’s all about using it. Remember how we unconsciously use our abs all day? This is a really great way to do it. Your booty gets a work out too! 3. Do crunches, on an exercise ball. It might just be me, but they hurt a lot less and then, you can do a lot more. And they are just as effective! 4. Do a move that is a full body workout. Pushups, planks, jumping jacks. These are sneaky ways to work on your core without feeling it so much. Because your whole body depends on your core to do these, you’ll get a tummy workout too. 5. Leg Lifts. This is a great workout, you will feel it all over your abs for the next 2 days and it works that hard to reach lower ab area. For me, these are super hard if I don’t do them for a long time, so try to be consistent and start with a small amount of them. Work your way to doing more in a set.